A controlled academic study carried out on a group of third year students using avatars, environments, text to speech, branching dialogues, decision trees, tracking, assessment & more in a Moodle test scenario. It shows how immersive eLearning works on phones, tablets, computers and VR headsets and what happened when a leading University deployed it. LearnBrite Plays Nice With All Of Them & More! Want to use your Adobe Captivate/Articulate Storyline modules in 3D/VR? No problem. Need to drop your immersive VR-Ready Scenarios into Moodle, Cornerstone onDemand, Topyx, Blackboard, Litmos, Docebo or any other LMS that supports SCORM/LTI? We’ve got you covered. No! You can build VR-Ready experiential learning modules with ABSOLUTELY NO CODING. But, if you have programming skills, you can enhance your learners’ experience in an almost unlimited number of ways. Yes! The VR-Ready workflow produces experiential learning modules that work on mobile phones, tablets, desktop & the leading VR headsets. Author once & deploy anywhere. Does it work on IE11? Yes! We know that many larger organizations rely on IE11/Edge Browser for their internet access. That’s why we’ve done everything possible to make the platform compatible with Microsoft browsers as well as ALL of the other major browsers for maximum coverage. This might be the best news of all. A basic Scenario tier subscription costs less than most people’s daily Starbucks habit. Yep, less than /day when you sign up for the annual plan. If you’d like to see the full price list, feel free to visit our pricing page. Do I have to build my own 3D assets? The system supports open 3D standards like Unity FBX, Google Poly, Microsoft Remix 3D, Sketchfab, SketchUp, TurboSquid & more. That means you can use our built-in library of hundreds of 3D assets, import ready made models from online repositories like those listed previously or have a 3D modeler make something custom for you. Need something built for you? LearnBrite Studios can handle all of your custom 3D modeling needs! That depends on your learning objectives, the type of interactions & your course design. But, most of the demos you see on this page took less than 8 hours to produce (including research). How hard will this be to roll out to the whole company? There’s nothing to install, so all your learners need is a link to access your training modules. You can also embed your work as SCORM or integrate via LTI to control access through your current LMS. In other words, if you had a learning module ready to go you could literally roll this out to the entire company this afternoon. Will I have to buy special equipment for my learners? No! Our experiential learning platform’s VR-Ready workflow is an “author once & deploy anywhere” solution. 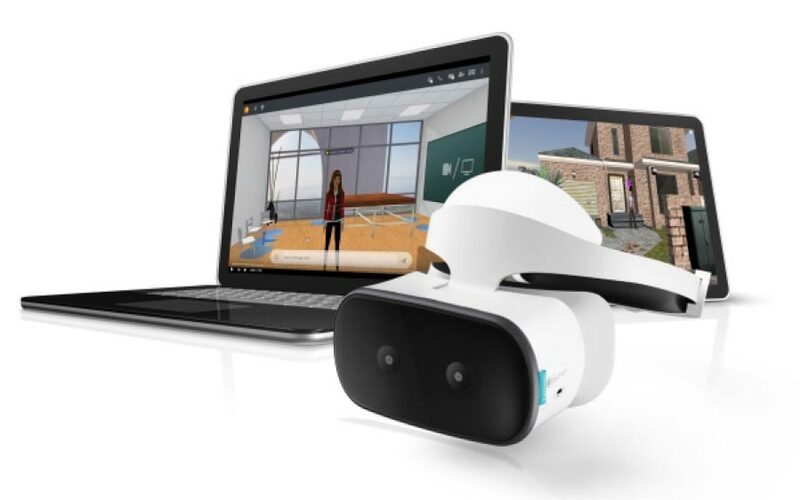 That means your learning modules will work on every device and all major browsers including, but not limited to VR equipment so your learners can use whatever they have access to. Does this support 360º videos/photos? Absolutely! You can create dynamic experiential learning environments using 360º photos, 360º videos or even 3D models that use open 3D standards like Unity FBX, Google Poly, Microsoft Remix 3D, Sketchfab, SketchUp, TurboSquid & more. Does it integrate with my company’s user accounts? We support Single Sign On (SSO) integrations through a variety of protocols. Feel free to contact support once you’ve started your free trial and they can walk you through the process. How easy will it be to get through my company’s security audit? We’ve been through the ringer with some of the biggest Fortune 100s so we have a pretty good idea of how to meet most security requirements. We’d be happy to jump on a call to discuss your specific needs anytime you’d like. Can I try LearnBrite before I buy? Of course! Click here to start your fully featured 30-day trial ABSOLUTELY FREE. No obligations, no contracts, cancel at any time, 100% risk free. By the time your done with your trial, we’re sure you’ll love LearnBrite so much you’ll become a permanent part of our family. We’ll send you an email with the details on how to do so when the time comes. If you want to join right away, just drop us a line [email protected] and we’ll get you taken care of. What happens to my courses if I cancel my subscription? In the unlikely event you decide to leave, don’t worry, we’ve got you covered. All of your VR-Ready experiential learning modules will remain fully accessible for your learners. The only catch is that you’ll no longer be able to edit or update them. But, if you decide to come back then everything will be right where you left it so you can get back to building cutting edge training. No way! All of the 3D elements are hosted on our servers while all of your intellectual property remains on your servers. Forget about any hidden fees with this platform. Can you build something for us? Of course we can! LearnBrite Studios is standing by to help you as much or as little as you need. Need 3D assets? No problem. Full on learning design? Simple. Custom programming solutions? Our favorite. In fact, the upper tiers of our subscription options even include monthly Instructional Design hours from one of our certified experts to help guarantee your learning success. Yes! We use our proprietary Troph.io Gamification API to track any interaction or even every interaction with your learning module to gain valuable insights on your learners. Now you can show stakeholders exactly what impacts company learning and helps move the needle. LearnBrite’s Hybrid Cloud security allows you to quickly link to internal documents and potentially sensitive information without worrying about unintended access or potential data breaches. That means all of your company information stays behind your firewalls and is only pulled in at run-time to guarantee bulletproof protection. We’ve worked hard to include built-in features like closed captioning & support for non-traditional inputs like gaze tracking (VR only) or voice commands (experimental) to help meet many 508 standards. However, the truth is 3D/VR simply isn’t compatible with everything on the list (ie. screen readers for the visually impaired). Contact us at [email protected] if you have a particular accessibility or inclusion concern that you’d like us to explore with you. No, unfortunately all of the experiential learning modules that you create will require an internet connection to run. The good news is that modules which don’t rely heavily on video should run just fine on basic connections such as 2G/3G which have been sufficient for our clients from Africa to Asia and many hard to reach locations all over the world.